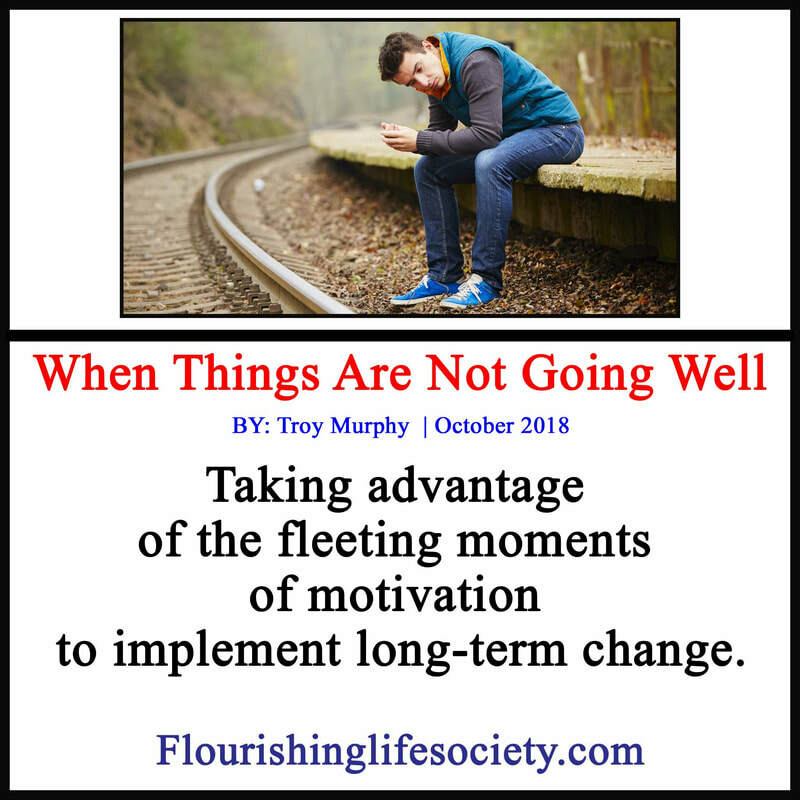 Taking advantage of the fleeting moments of motivation to implement long-term change. We stagnate; we stumble; and we depress. Sometimes the joys of life aren’t so joyful. We need change and we need change now; but where do we start? Knowing something isn’t right and knowing how to change are not necessarily synonymous. Even when we know exactly what is wrong, tackling the snarling beast isn’t simple. A few failed attempts and we protectively cower into a helpless stupor. Life has outmatched us, and we are dumbfounded on the next move. However, we rarely render ourselves completely powerless. There is almost always an escape. There is hope. Life is not complete and failure not eminent. But in these devastating moments of despair, we can’t keep trying to solve the same problem, the same way. Navigating the particulars of complex human cultures requires knowledge, skill, and resilience. Most children are given a sufficient foundation to venture into the elaborate jungles of survival and prevail—procure employment, secure housing, and reasonably prepare for the future. Seldom does a child emerge into adulthood with so much preparation that life is easy. The struggle for survival intrudes on well-being, poking our solitude, and interrupting our joy. "However, we rarely render ourselves completely powerless. There is almost always an escape. There is hope." As we try to convert our time into money, our relationships into intimacy, and our desires into joys, we will face obstacles—on every turn. Here in the real world, we learn life is more than natural stages of advancement but constant hard-fought battles that must be won. We must be resilient, knowledgeable, skilled, and resourceful. We are not always victorious. We settle into a groove that works, only to find life changes and our comfortable routines have left us behind and burdened. Acknowledging our lack, our lingering position behind the pack, is disquieting. Emotions alarm of impending disaster, demanding change, and a plan of action. Shame, guilt, sorrow and anger all live here. The most telling sign of success is how a person responds to these emotions. Are they charged with action or protective with excuses? Do they seek novel solutions or cowardly escapes? The deepest ruts of failure are found in these well-traveled paths. The repeated responses of kicking against the pricks—revolving relationships, stagnating careers, accumulating debts, and destroying vices. Every now and then, those stuck in the merry-go-round of sorrow jolted into action. Something a little worse happens and they are motivated to escape, to jump over the confining walls of subpar existence and the comfort of the stinking morass of sorrows. The motivation fails to last. They try the same escape routines to lose weight, improve careers, abandon the bottle, or leave the abuser and end up right back where they began, digging the rut a little deeper. Relying on occasional shots of motivation alone doesn’t work. Success demands we recognize the dead-end alley before we crash into the wall. Life sends of signals, but we must be wise enough to know those momentary bursts of energy are insufficient; they burn out. We must channel these blessed moments into new and novel solutions, building new resources, strengthening resolves, and better budgeting of this brief window. For the junkie, the momentary power to avoid a fix will not continue indefinitely. The quick breather of sobriety must be utilized to reconstruct the environment to better resist the maddening desires to relapse. The courageous escape from an abuser can quickly fizzle into a desperate return without the garnering support of others. The resolve to better one’s career may start with a bang, arriving early and leaving late, but without a more comprehensive plan, the early mornings soon dwindle back to the same lackadaisical approach. Our well-being cannot be dissected into non-connected parts. The whole is always greater than parts. When we routinely run into stubborn roadblocks, wisdom teaches to take a different approach. In a recent article I wrote about the nine pillars of well-being. Often escape from a persistent problem requires focusing attention (during those momentary moments of motivation) on a different pillar, building strength, confidence and hope from efforts that succeed: our relationship woes may be bettered through an exercise routine. Change is never easy. When things are not working, we momentarily are charged with enough energy to act in great ways. We must work into these momentary bursts changes that ease the burden, increases skill, and keep positive movement alive. We can do something different; we can make things work again; we can enjoy the beauties of living.